renewable energy? Thirteen other Contra Costa cities including Lafayette, Moraga, Walnut Creek, Concord, Danville, El Cerrito, and unincorporated Contra Costa County offer MCE (originally Marin Clean Energy) as a second energy choice to residents and businesses. But Orinda has not yet given us access to choose energy providers. MCE offers cleaner electricity than PG&E for slightly less cost.Adding MCE as an alternative electricity provider also includes the no-cost choice for each household or business to opt-out of MCE and continue to use PG&E with no change to existing rates. Ask the city council to put MCE on the agenda for discussion. Call, write, or come to the next Orinda City Council Meeting, Tuesday, April 9 at 7:00 pm at the Orinda Library Auditorium. Write to the city council members c/o the City Clerk, Sheri Smith at ssmith@cityoforinda.org. 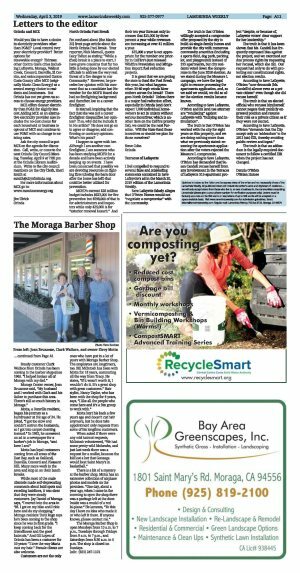 I'm confused about [the March 20] front page article about the North Orinda Fuel Break. Your reporter, Nick Marnell, quotes Lucy Talbot as stating: "While a (fuel) break is a place to start, I have grave concerns that far too little is being done by our elected officials to address the very real threat of a fire danger to our Community." However, he precedes her opinion with his comment that as a candidate last November for the MOFD Board she had no firefighting background and therefore lost to a career firefighter. Is Marnell implying that the fact that she was not a career firefighter disqualifies her opinion? If so, why did he include it in his article? He does not go on to agree or disagree; add confirming or contrary opinions. What's his point? I happen to agree with her. Although I am another non-firefighter, I am someone who has been studying MOFD for a decade and have been actively keeping up on events. I have been concerned that possibly we are devoting resources on fighting fires (closing the barn door after the horse has left) that could be better utilized for prevention. MOFD's current $28 million budget includes $623,000 for fire prevention but $598,000 of that is for administrators and inspectors while only $25,000 is for "exterior removal hazard." And their ten year forecast only increases that $25,000 by three percent a year while revenues are increasing at over $1 million a year. $25,000 a year is not appropriate for the number one priority in CalFire's just released Wildfire Prevention and Mitigation Report; fuel reduction projects. It is great that we are getting the state to fund the Fuel Break this year, but what happens when 30-40 mph winds blow embers across the break? There goes North Orinda? Unless there is a major fuel reduction effort, especially in Orinda (and don't expect 7,000 individual homeowners to act in unison without serious incentives; which is another item on the CalFire priority list), we could be the next Paradise. Will the State fund those incentives or should we plan for those ourselves? I feel compelled to respond to several false and misleading statements contained in Save Lafayette's ad in the March 20, 2019 edition of the Lamorinda Weekly. Save Lafayette falsely alleges that O'Brien Homes would not "negotiate a compromise" with the community. The truth is that O'Brien willingly accepted a compromise offer proposed by the city to build 44 single-family homes and provide the city with numerous community amenities (including a sports field, dog park, parking lot, and playground) instead of 315 apartments, but city residents voted down the compromise in the June 2018 election. As we stated during the Measure L campaign, we have the legal right to resume processing the apartments application, and, as we said we would, we did so after the election results became known. According to Save Lafayette, O'Brien and its land use attorney are "retaliating" against Lafayette with "bullying and intimidation". The truth is that O'Brien has worked with the city for eight years on this property, and we are doing nothing more than what we previously stated: resuming the apartments application after the voters rejected the Measure L compromise. According to Save Lafayette, O'Brien has demanded that Susan Candell recuse herself from any involvement in the Terraces of Lafayette 315-apartment project "despite, or because of, Lafayette voters' clear support for her leadership." The truth is that it has been shown that Ms. Candell has frequently expressed bias against the project, and we exercised our due process rights by requesting her recusal, which she did. Our request had only to do with protecting our constitutional rights, not election results. According to Save Lafayette, O'Brien "now demands (Ms. Candell's) silence even as a private citizen" even though she did recuse herself. The truth is that an elected official who recuses him/herself cannot negate their publicly expressed position and resume their role as a private citizen as if they were not elected. According to Save Lafayette, O'Brien "demands that the City accept only an `addendum' to the 2012 (sic) EIR, thereby avoiding public review and input." The truth is that an addendum is the legally-required document to follow a certified EIR when the project has not changed.